e*thirteen 9-44 cassette on high gear with derailleur taking up the chain slack (click to enlarge). We’ve put in a few more rides on our TRS+ cassette and it continues to work well. With winter insulation and lack of fitness, the extra range has come in quite handy. Also with trails a bit softer than normal, it really feels like riding in molasses sometimes and pedaling on soft trails is indeed more work. Performance has been excellent so far with shifting on par with the SRAM XO cassette that it replaced. There no more noise than before and there doesn’t seem to be any extra pulley drag on the biggest cog. One thing to note is the 44 tooth lowest gear is not a dramatic difference from the 42 that it replaces. It doesn’t seem as much a relief compare to moving from a 32 to a 34 on those old drivetrains. The reason seems to be that as the cogs get bigger, 2 tooth jumps in sizes are proportionally smaller. a 32 to 34 tooth change is a 6.25% change while a 42 to 44 is 4.76 % change. Regardless, it is a lighter gear that’s coming in handy and performs well so far. e*thirteen announced the TRS+ Cassette earlier this year and some folks jumped for joy while others were left befuddled. Why on earth would someone make a cassette with a range from 9 teeth to 44 teeth? Isn’t the standard 10-42t from Sram enough? If you use a 10-42t 1×11 and are perfectly happy with it, then you’re good and there is no need to read on. We are a firm believer that that the Sram 1×11 drivetrain is one of the greatest cycling evolutions in our sport. But if you’re one of those 1×11 users looking for a lighter gear on occasion or dare we say always, then perhaps there is something here for you. Or maybe you’re a 2×10 or 3×10 user tentative to make the jump to 1×11 because of the lack of a gear or two, you can pursue this or take comfort that there is an option upgrade path if you need. e*thirteen 9-44 cassette on a Ritchey Timberwolf 1×11 (click to enlarge). 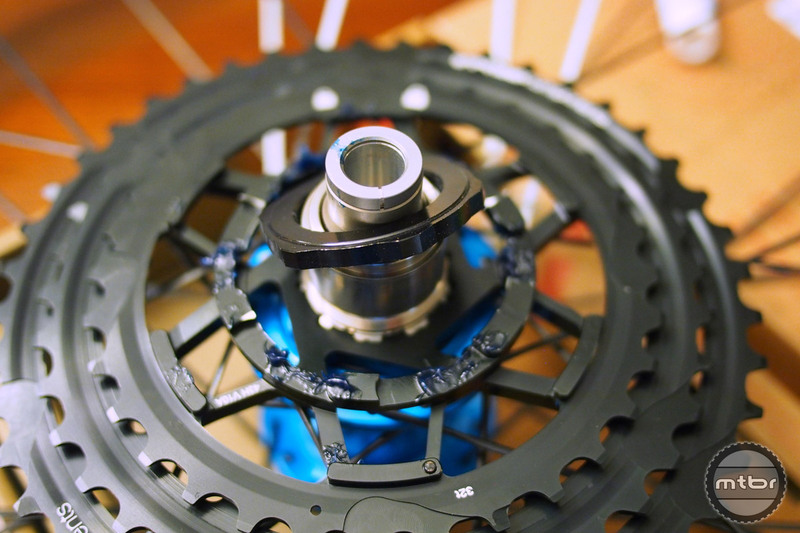 1×11 was originally created and marketed towards the most advanced and fit riders with its XX1 introduction. Ultra expensive and lightweight, it served the needs of racers with high aspirations and high power to weight ratios. But fast forward a few years and you’ll see the market for 1×11 has expanded in a big way. 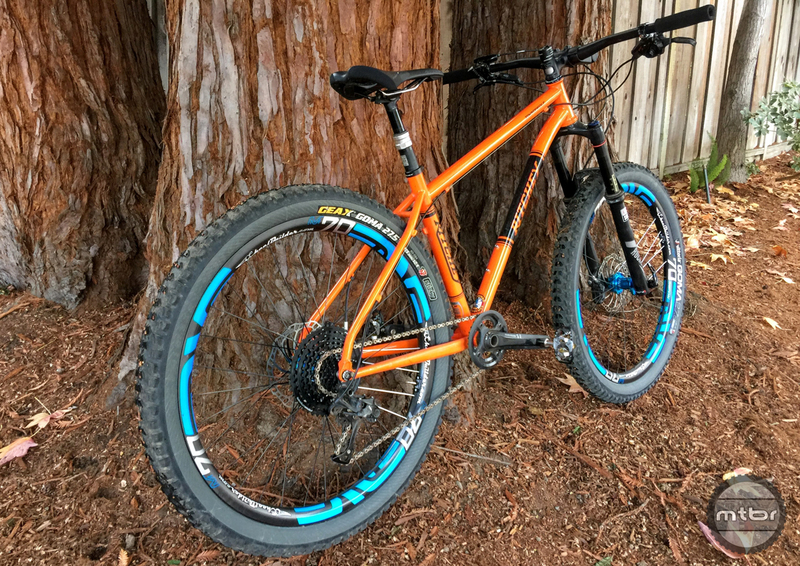 The advantages of an intuitive, lighter system is just so hard to deny as folks pursue this drivetrain that simplifies the mountain biking experience. The cassette is shrink-wrapped so it stays in place and the tool and lock ring are securely positioned (click to enlarge). e*thirteen has deep engineering experience and they tackled the problem head-on. They sought out to design a lightweight cassette with a lower low gear with the 44t and a higher high gear with the 9t. The 44t is the biggest revelation here as the rider who is always left struggling on the 42t ring now has a lighter option. Perhaps the rider or the bike has a few pounds to lose. Maybe the typical rides are in elevation and they start out with 3000 foot climbs. Or they might be some knee pain or hip pain in the equation while the body gets warmed up. In any case, it’s good to have an option. Riders have certainly demonstrated the need for a lower gear as they switch out the front ring to a 30t or ‘gasp’ a 28t. While they work, there are sacrifices in feel and efficiency when one shrinks the front ring. The lock ring holds the big three cogs in place (click to enlarge). The other side of this spectrum is the 9 tooth ring for the high gear. It definitely is an unprecedented mass market product as 99% of mountain bikes and even road bikes have a smallest cog of 11 or 10t. 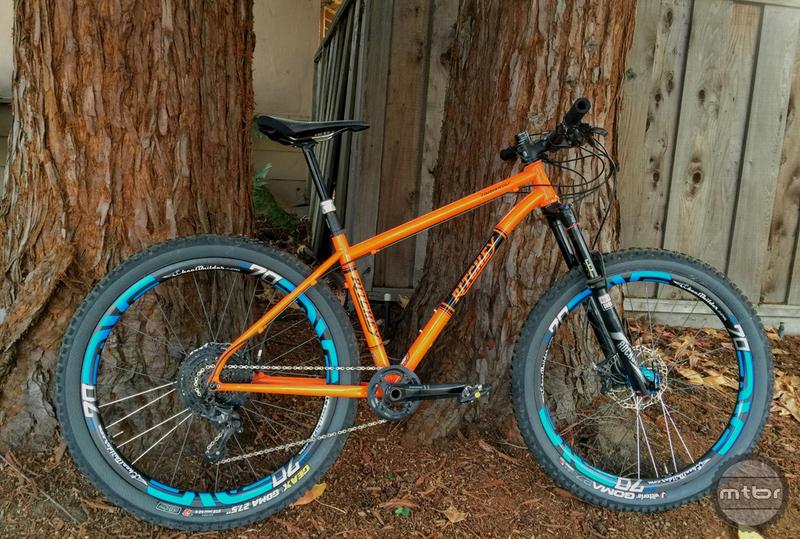 But with a mountain bike 1×11 system, the range can match that of a 2×10 system and that is valuable to many, specially those with flat and descent sections of the ride where one needs to pedal. Using the Sram XD Drive hub body, e*thirteen was able to fit a 9 tooth since the smaller cogs are actually floating and not wrapped around the hub body. The only trick was locking the cogs in place and that’s were e*thirteen designed an ingenious locking mechanism to keep the cogs in place. Gives this bike ultimate range with a 1×11 (click to enlarge). Installation was a cinch and we were impressed by the first-rate packaging, tools and materials. We installed it on our test Ritchey Timberwolf and went out for a few rides. 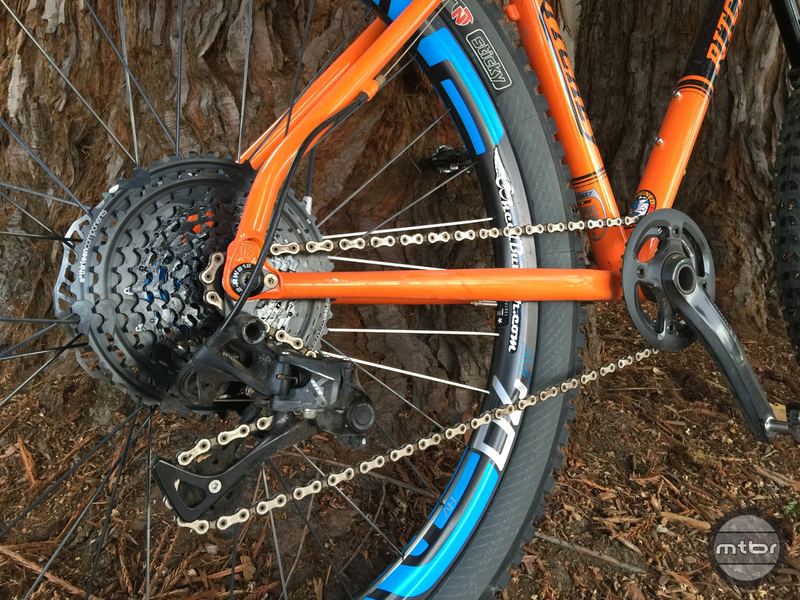 The Ritchey has a chain optimized for a 10-42 length so we tried it with that setup first. The chain is a tad short and we’ll add a couple links as it’s close to maxing out the derailleur. But we anticipate some users will ride it this way initially as they swap out their cogset. Full suspension users need to be aware that if it’s critical to add links if the suspension action stretches the chain past its max length. We’re pleased to report that shifting was crisp, snappy and seems as good as the 10-42t stock cassette. There’s no hesitation in any of the rings as the chain goes through all the cogs. The shift to the 44t is smooth and we didn’t have to adjust our B-tension screw to keep the upper pulley from getting too close to the big cog. Shifts on the big cogs felt natural and even. On the smaller cogs, the shift from the 10t to the 9t was perfect. It was a progressive shift that felt really good while pedaling. The bigger problem was the jump from 12t to 10t feel pretty abrupt just as in all 10-42 systems. We would have preferred that e*thirteen do a 10t-11t-12t sequence to make this high end more useable. But we understand that it won’t satisfy the needs of some. And it certainly would not make us much news or buzz without the presence of the 9t. One pleasant revelation is that although we don’t anticipate needing the 9t for our local rides is it allows us to reduce our front ring without losing the high gear range of our old drivetrain. For example, we can drop the front from a 32t to a 30t and still be satisfied with the high gear. So essentially the 9t allows us an even lighter gear. So far so good so the only real issues is durability and longevity. But one great asset of this cassette is it is replaceable in segments. the big three cog aluminum cluster is replaceable so if that wears out first, that can be replaced independently to lower the cost of maintenance. The 11 speed cassette has a price of $309. Replacing the 3 big cogs will cost $104. QBP will have in stock January 29, 2016. I’ve had money in hand since these first came out but they’ve been out of stock forever. Having the same or more range as a 2×10 is awesome. I just installed my 30t chain ring (down from a 32t on my X01) in anticipation for the new cassette. More top end even with the 30t and considerably more low end with a 30/44. While I don’t like spending more money, I don’t see the problem with it requiring a different driver. If you want the 9t and 10t cogs, you must have a different driver for them to work and luckily SRAM already makes one which allows the smaller sizes. There’s no way around it, if it weren’t SRAM, they would have to make one. Have your shop call ethirteen direct, mine just got me one from them. Wow. Outrageously expensive. I’d rather go with 1×10 than 1×11 due to the expense of all 1×11 components (it’s been getting a lot better though). 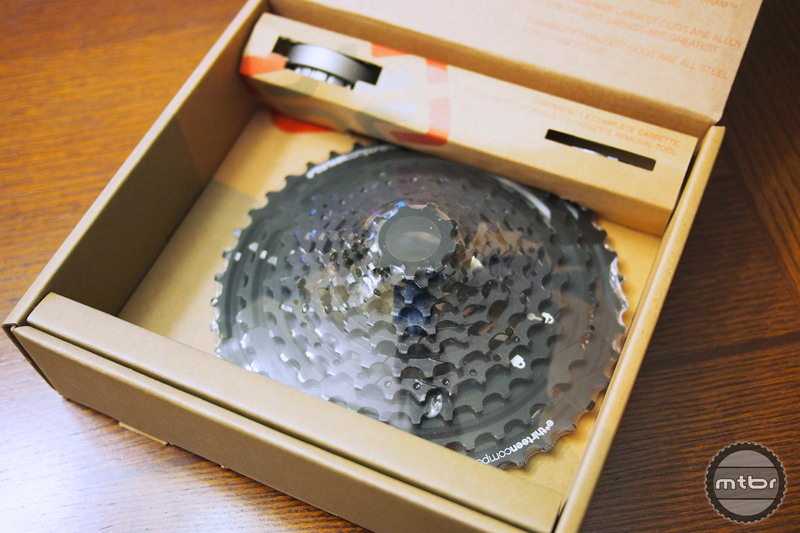 And I’d rather get the 1×10 cassette from Praxis that runs 11-40t than this 9-42t cassette for $275. 1x is definitely the way to go. It just simplifies things, makes the bike a little lighter and you don’t have to worry about the front derailleur freezing up when riding through water on the colder days. There doesn’t seems to be any mention in the article that SRAM actually tried running a 9T cog when they were developing their 1 x 11 system, but didn’t end up using it because of the ‘lumpy’ feeling it gave whilst pedaling? I wonder if E-13 have chosen to ignore this or managed to engineer a way round it. I was wondering the same thing. I guess I prefer lumpy to coasting though! I’m glad to see I’m not the only one running a simple bash guard up front. I know all the cool kids have minimalist chain guides or nothing. However, I like not taking the chance on destroying a ring (seen this happen on several friend’s bikes), the simple additional chain retention and the low cost. I have dropped a chain only once in more than two years with my 1X set up. Old school that works. More range on my 1×11 would be great! However, the price is pretty steep. Make a cheaper but maybe heavier all steel version and I would buy it. My bike currently has the cheapest all steel 1×11 Sram GX cassette that sells for about $130 and it works fine. I sure wish new great products like this also came in an affordable version.